Helena Hauff is one of a kind. Part musician, part mad scientist, she’s a vinyl addict and a turntable maverick, but she almost lost it all when her apartment building burned down. She only makes music on 30-year-old machines and she says she finds computers “uninspiring and distracting”. She doesn’t own a credit card, she actively avoids smartphones and she’s not on Facebook — like we said, she’s one of a kind. Born and raised in Germany’s second largest city, Hamburg, Hauff’s journey from bedroom tinkerer to techno’s A-list has been convoluted — she’s tried her hand as a fine artist and a physicist too. After both fell through, she’s pursued a life as a DJ/producer solidly and successfully for the best part of a decade, touring at weekends and returning home to jam-out in a haven of twisted wires and discontinued drum machines during the week. Her studio has one foot in the past, but her music — rough, acerbic, unapologetic — sounds like it’s come from a dark and dystopian future. Her DJ sets are just as dynamic; expect ‘90s acid anthems mixed with post-punk off-cuts and noisy EBM when Helena’s at the helm. Her skills as a selector haven’t gone unnoticed — she’s just been locked down as one of BBC Radio 1’s 2017 residents. It’s the checkmate move in her slowly bubbling career, an invitation for fans globally to enter the darkly weird and wonderful world of Helena Hauff. DJing and dabbling in production for the last eight years, Helena Hauff is far from an overnight success. She’s gradually gained recognition thanks to her intoxicating DJ sets, alongside a smattering of hard-hitting productions and her close relationship with UK independent label, Ninja Tune. It’s on the imprint’s rougher, less-accessible partner label, Werkdiscs, that Hauff has really found her niche, releasing her first full-length, ‘Discreet Desires’, in September 2015. It was the perfect snapshot of what Hauff is all about: ten tracks of acidic, machine-made techno without a computer programme in sight. There were flecks of electro, post-punk and EBM in there too, alongside subtle moments of misty-eyed musicianship and the occasional slamming ‘80s synth solo. Most importantly, it put Hauff in front of the right people, bulking up her international bookings and pushing her sound further outside German borders. “It definitely opened a door for me, that release,” says Helena. The result of that meeting was Hauff’s first record for Werkdiscs, ‘Actio Reactio’, which dropped in late 2013. A rough-and-ready minimal 12-inch that was far sparser than anything on ‘Discreet Desires’, it celebrated her love of minimal wave and paved a way for releases for labels like Lux Rec, Panzerkreuz and Solar One Music. Since then there’s little doubt that Hauff’s sound has matured, her work denser and more considered than when she first started, but she’s never lost her signature acidic twist. Fast forward to 2017 and Hauff has already chalked up bookings at Dekmantel’s Sao Paulo edition, Sonar in Iceland and an all-nighter at Brixton-based club, Phonox. But it’s in none of these places where DJ Mag manages to pin her down — instead it’s the industrial German city of Essen where DJ Mag finally meets her. “Sorry, you’ve had to come to one of Germany’s least exciting cities to meet me,” she jokes. She’s got a point — Essen doesn’t seem like a city flush with techno sensibility. If anything, it feels sleepy and deserted — the streets are eerily silent by 10pm as we walk briskly to meet her on a frigid December evening. She’s been booked to spin for a whopping five hours tonight at the slightly bizarrely-titled nightclub, GoeTheBunker — a dimly-lit rave cave in Essen’s back blocks. 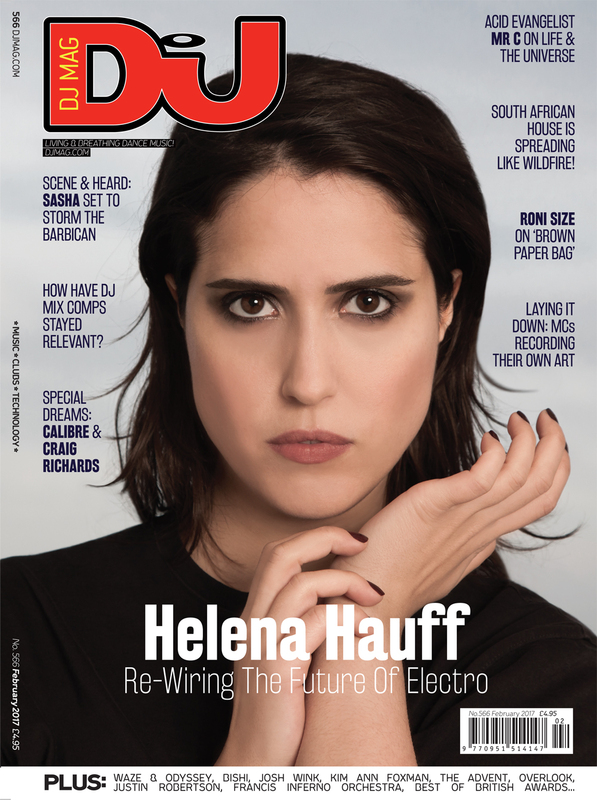 DJ Mag is partly here thanks to Helena’s newly-announced BBC Radio 1 Residency, a move that’s set to propel her to full-scale techno ubiquity. And it’s about time. Although she’s been on our radar for over four years, this is the move that’s made her ripe for UK cover stardom. It’s yet to be seen how Hauff’s neck-snapping signature club sets will translate into a radio format, but it seems like a perfectly-timed challenge for the on-the-rise German selector. “Well, I think I’m going to treat it like a radio show,” she says, matter-of-factly. “I mean, I know that sounds obvious, but I don’t think I’m going to have one hour of straight beats all the way through, then a talking show as well — I want to play actual songs. With talking in-between, obviously. It’s going to be mostly electronic music, although I might play something unexpected too — but only if I feel like, ‘Yes, right now I really need this record!’. And it’s going to be more or less techno. I really want to showcase all the different styles within that — all the different parts of the genre that I like. I want it to be very diverse,” she concludes. As DJ Mag heads to watch her set later that evening at GoeTheBunker, we’re not entirely sure what to expect — but that’s all part of Helena Hauff's appeal. John Acquaviva and Texas Audio’s ‘Assassin’ is slamming from the stacks as DJ Mag enters, whilst we weave our way past a pile of broken TVs and a graffiti-covered bar. The crowd inside is a typical mix of techno freaks and fresh-faced club kids — DJ Mag watches transfixed as a young couple thrash arm-in-arm at front of the heaving throng. Helena stands silhouetted behind the decks, puffing on a cigarette and digging in her record bag, as she grooves nonchalantly to the sound of Lory D’s acid classic, ‘Acix9999’. It’s not long before Andreas Gehm’s legendary floorfiller ‘Track 2’ starts to seep from the speakers, followed by a spin of anti-establishment anthem, ‘Boycott’, by Italian trio The Fool’s Stone. She’s mixing impeccably on vinyl, and is set to do so for another four hours, before she finishes up at an eyeball-burning 7am. 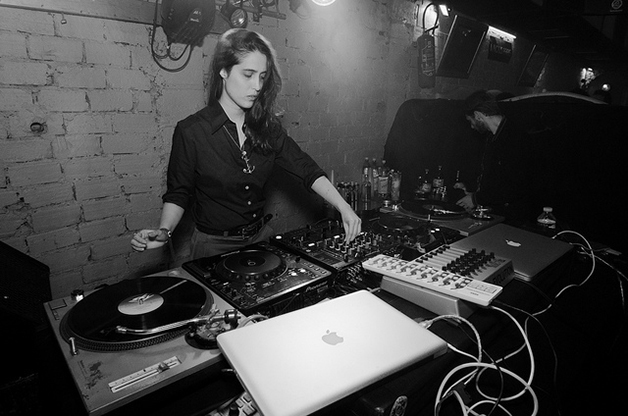 But it’s not just her BBC Radio 1 residency, her impressive DJ ability or her releases on Werkdiscs that have given Helena Hauff a leg up. It’s her training ground, Hamburg’s Golden Pudel club, that’s also proven influential — not only technically as a DJ but as a tried-and-tested selector. A small and smoke-filled night-spot down by the Hamburg docks, the Golden Pudel remains one of clubland’s most feted venues, a place where atmosphere is everything and mixing is by-the-by — rumour has it at that at one stage the venue only owned one turntable. Despite its legendary status as one of Europe’s purist techno havens, the Golden Pudel currently stands closed. In February 2016 a massive fire broke out at the venue, the result of a suspected arson attempt, and the owners are still in the process of attempting to rebuild the venue. Helena, Cindy Looper, Trentemøller and Modeselektor all joined the fundraising drive to collect donations for the rebuild of the venue in November last year, though there is no official word yet on when or whether the Golden Pudel will return. After leaving high school Hauff tried university as an outlet for her creativity, where she studied fine art, followed by physics. It was here that she had her first encounter with music production software, though it would be many years before she would consider music as a viable career option. Breaking the mould seems to come naturally to Hauff — the music she makes is both brave and divisive. It’s a theme that’s also shaped her personal life — there’s definitely a little bit of punk rock behind Helena’s cheery demeanour. “It definitely didn’t seem like it was the sensible decision to leave university. I just felt like I had to. It just didn’t feel good there, it wasn’t made for me,” she says, defiantly. She would try to make music again a few years later, this time on hardware thanks to a chance visit to a fellow gear-head’s studio who also DJ’d at the Pudel — and from then on she never looked back. It’s the intersection between art and science that’s always fascinated Hauff, and goes some way to explaining her nostalgic approach to production. She is staunchly a vinyl DJ and she has absolutely no interest in going digital. Period. A look inside her home studio reveals a tangled mess of vintage machines and half-built kit, spanning everything from classic TR-303s and an 808 to an MPC-2000, Boss RE-20 pedals and a Roland Alpha Juno. With a studio mostly full of kit from 30 years ago, there’s a retro quality to Hauff’s music — a tangible link with the rough, DIY attitudes of early producers in Chicago and Detroit. “It’s funny because I wouldn’t say I’m necessarily a nostalgic person — I’m really into science,” she says. “I just feel like using hardware or playing vinyl, it just seems to suit me quite well. Maybe it’s the tactile element, and perhaps because I am quite an analytical person it feels good to get some of that out of my creative process. Perhaps the biggest production challenge Helena has overcome is the loss of her studio six years ago. Her apartment building burned down in one of Hamburg’s biggest ever residential fires, leaving her temporarily homeless and her studio sodden with water. “They pumped water directly into my flat as mine was the top floor — I think it was seven hours in total,” she says, still in slight disbelief. 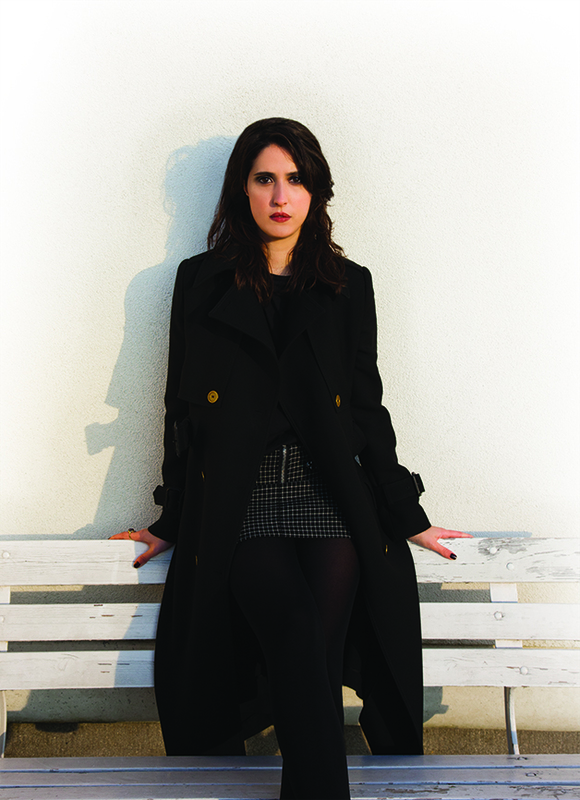 It’s no secret that Helena Hauff loves her machines. She talks about her kit passionately, and you can tell her obsession with production runs true and deep. “You should never produce for the sake of it, it’s a real passion thing for me. If you don’t love it, don’t do it,” she states with steely resolve. The same cannot be said of her thoughts on modern technology. She’s not on Facebook, she doesn’t have Twitter, and don’t expect her to be starting up an Instagram account anytime soon. “Maybe it would help my career [to be on social networks] but I just simply can’t be arsed,” she says candidly. That’s not to say that Helena isn’t connected to her fanbase. “I get some really cool emails from people. People actually sometimes tell me how much they liked a set or something — and that’s really, really nice. I always try to reply to every single one, I try to read as much as possible,” she says. It’s her offline interactions that really spur her on — Helena loves meeting new people, heading to new cities, discovering new clubs. You won't catch her complaining during a weekend on the road, though she prefers to spin in the intimacy of a club rather than the confines of 2000-capacity festival tent. It’s a surprisingly positive slant on life as a travelling artist — all too often DJ Mag has sat through rants about the sorry plight of the tour-weary DJ. “There is a massive difference between a club and, say, a big festival. I prefer clubs, because you get to meet the people. You get the locals picking you up from the airport, taking you for dinner, you have a drink with them, and then you spend a night in a club with them. It’s always this great experience, great people showing you their city. And I just love that,” she says, grinning widely. Helena Hauff is our February cover star — magazine on stands now. Charlotte Lucy Cijffers is DJ Mag's digital editor. Follow her Twitter.